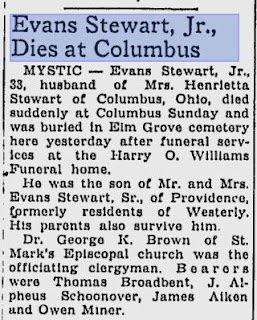 While using the Google News Archive, I stumbled across this short obituary for my maternal uncle in the newspaper archives of "The Day" a newspaper that covers New London county in Connecticut. I was very surprised because I couldn't find much in the Columbus, Ohio area where the death record of my uncle was found. 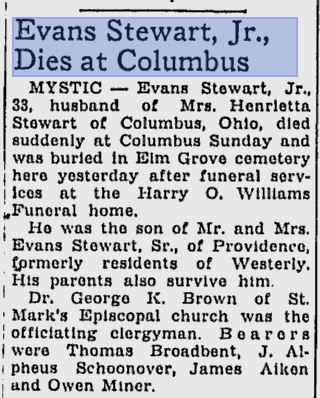 Knowing that he is buried with his parents (my grandparents) in Mystic (Stonington, CT), I see that this mention of the actual burial gives me a date when the burial took place. the news article does contain errors but it also contains information NOT found in my family Bible. It confirms the name of his wife, but doesn't mention that he was my mother's brother. As I suspected, my grandparents were of the Episcopal faith. My parents were married in an Episcopal Church in 1946 in Cranston, RI and why my mother wanted to join an Episcopal Church. It was when I began to read the list the pall bearers, I see that my father, Thomas Broadfoot's name is written incorrectly but it is certainly him. 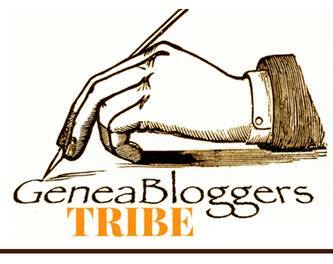 James Aiken worked with my grandfather and I remember him. Owen Miner was my grandfather's first cousin and lived near to the area but in Groton, CT.